IPL 20Twenty series has been started in a big way. With almost all the big players of the world playing, it has been able to attract the attention of the whole world. But, I will discuss this whole IPL T20 series in my next posting. Here I want to discuss, just recently concluded test series between India and South Africa. This whole series was like typical bollywood movie. It has got thrill, action, emotions, all the ups and down, and in the end happy ending (for Indians, of course ). In the first test, Chepauk Chenai, provide a mouth watering track for the batsmen. The only way, the team could loose that match is by playing really bad. Well, South African team don’t have such habits. They send very strong signals to the Indian team that they mean business by posting a huge score of 540 in their first innings. India gave stern reply by scoring 627 in their first innings. Thanks to Virender Sehwag for his blistering 319. With comfortably poised on 468/1 at the end of day 3, they were bundled out for 627, just adding 159 runs and losing 9 wickets in the process. 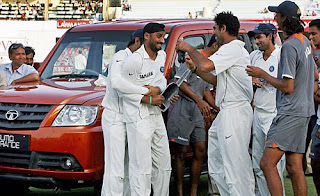 The only team that could win this test match at this juncture was India and South Africa was very much aware of that. They have to play it for draw, and they didn’t do any mistake. On that flat pitch it was not difficult also. They ended their second inning at the test match with 331/5. If you try to take in depth review of this test match, you may get the feeling that it was South African team who has got psychological victory. 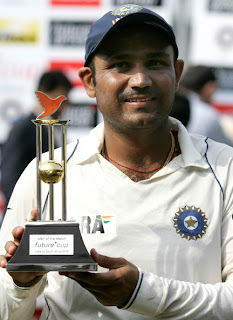 Though India posted a mammoth score of 627 in their 1st innings, Sehwag has contributed more than 50% in that. 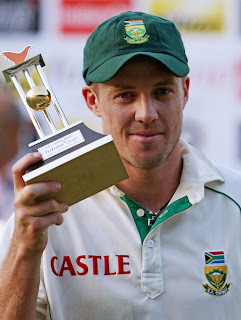 But, in the case of South Africa that was not the case, their we centurion as well double centurion. So it was more like team effort than the individual efforts. Also in the bowling department, what I feel is that South Africa has performed better than India. Indian bowlers didn’t make any impact whatsoever. But, after overcoming the hindrance named Virender Sehwag, South African bowlers were all over Indian batsmen, winding them up very quickly. Thus, it was SA not India who excels in all the department of the game not India. In second test, Motera Ahmedabad, it was all over for India in the first day itself, when they bundled out for just a paltry 76 runs. Though the pitch was more favorable to Africans than Indians, score of 76 runs in an innings can’t be justifiable. There was no devil in the pitch, and it was very much proved by fine batting performance of the Africans. India has to face one of the worst defeat of the recent times. Third test, India had to win that. India used their most trusted formula, which work many times for them. Typical Indian turning pitch was waiting for SA at Green Park Kanpur. Just, after having first view of the pitch, Smith’s face become pale yellow. Even in the absence of Kumble, Indian bowlers proved lethal. In both the innings Africans were dancing on Harbhajan’s and Sehwag’s deliveries. Indians were also not that comfortable in their batting department but thanks to Dada’s (Ganguly) knock and Indian wagging tail, India could get valuable lead of 60 runs. 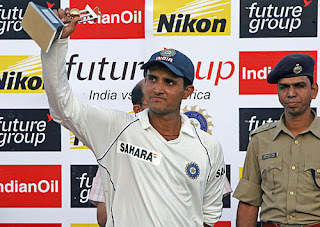 In second innings Dravid and Ganguly made sure that their shouldn’t be more drama in that match. India leveled the series 1-1.
recommendations, please let me know. Cheers! I am continuously searching online for posts that can benefit me. very good operate. I just additional up your RSS feed to my MSN Information Reader. strongly about it and love reading more on this topic. problem. May be that is you! Taking a look ahead to see you. hear is a bunch of whining about one thing that you could possibly fix for those who werent too busy searching for attention. switching to another platform. I have heard good things about blogengine. matter, all your points of view tend to be quite stimulating. event I did enjoy reading through it. generally yourself not wholly certain of your argument. may have a hyperlink change agreement among us! Thanks a lot for sharing this with all of us you actually know what you're talking about! Bookmarked. Please also visit my website =). We could have a link exchange contract between us! approximately all significant infos. I’d like to see more posts like this. rest of the visitors have to point out.Very well done. be having a look for. am attempting to find things to enhance my website! I was recommended this website by way of my cousin. about my trouble. You're wonderful! Thank you! to my friends. I'm sure they will be benefited from this website. a consequence thrilled to learn all of them and have in effect unquestionably been taking advantage of them. not expressing gratitude to you earlier. good enough to make use of some of your ideas! instead of that, this is fantastic blog. A great read. to be shared across the web. Disgrace on Google for no longer positioning this put up upper!